Here’s a cool new review tool that makes it easy for customers to review your business. It links to your company’s listings on several review sites. Contact us for details (805) 226-9890. 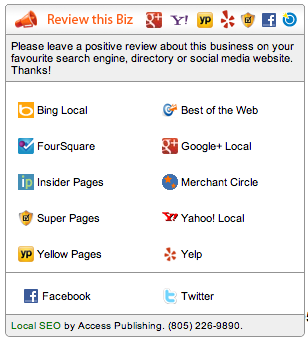 Getting reviews is important for building up a company’s online visibility. Search engines like Google, Bing and Yahoo rely on reviews to help rank listings on their websites. Good reviews establish the credibility and trustworthiness of a business. Here are some tips on how to get more reviews for small business people. The number one tip for getting more reviews is to ask for them and to train you staff to ask for them. The next time a customer tells you what a great job you did for them, ask them for a review. When you go above and beyond expectations, ask for a review. Hand your customers Review Generator Cards to encourage them to leave a positive review. 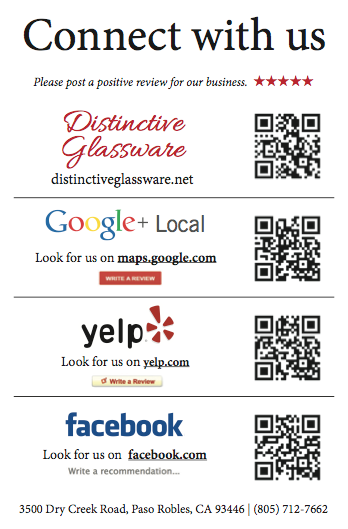 Hand your customer a card with links to reviews sites like Google+ Local, Yelp, Yahoo, Facebook, CitySearch, InsiderPages and more. With more options, they can choose a familiar website. Add links to your “Contact Us” or “Testimonials” page on your website and let your customers know they can simply go to your website to find places to leave a review. Ask for authentic reviews. Most sites have polices and conditions. They are important to follow. They usuallly prohibit owners, managers and employees from leaving reviews. If the review site’s filter detects a fake review, it can punish your company with lower rankings. Don’t send an email blast to dozens of customers asking for reviews. Multiple testimonials written in a single day or even in a week can trigger the spam filter and cause the reviews to disappear. By Scott Brennan. Connect with him on Google+. Access Publishing, 806 9th Street #2D, Paso Robles, CA 93446, (805) 226-9890.